Chaos Theory Paul Cézanne said we live in a rainbow of chaos. 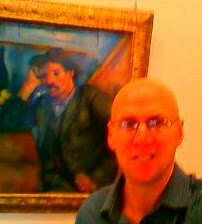 Here I am at The Hermitage in front of his paintings that were "transfered" after WW2. Chaos to me is rejecting all you have learned. Chaos is being yourself. Я устал от пытается найти счастье в себе ложь и лекарственных препаратов. Если я вам понадоблюсь, я буду в баре. I'm tired of trying to find happiness through lies and self-medicating. If you need me, I'll be at the bar. Makes me think of Politics, and President´s who also could be strippers, names like Madison,Taylor,Kennedy, and Reagan, who when they did their job right, suspended our country´s disbelief, and the bald spot and the mortgage ceased to exist.